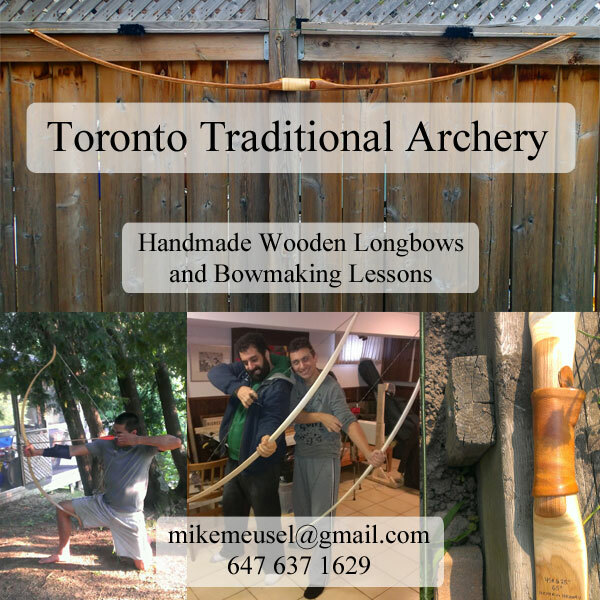 I have signed up for bowyer lessons from Mike Meusel in Toronto. I have been making bows using my amateur bow-making skills for 26 years now, so this will be the first time I am getting proper training by someone who is really good at making bows. Lessons? 5 to 6 sessions, each session is 4-5 hours. What do I get? Any bow(s) that I make during the approx. 20 to 30 hours of bow-making experience. Afterwards? I have purchased 2 pieces of walnut and 2 pieces of cherry so I can work on making 2 walnut flatbows and 2 cherry flatbows during the winter. So my plan is to learn Mike's method of making bows and then apply that new knowledge when I am making the 4 new bows during the winter. Mike also sells longbows, flatbows and pyramid bows. For a custom made bow contact him using the info below.